The ceremony held by Hezbollah in Nabatieh to mark the anniversary of the Second Lebanon War. 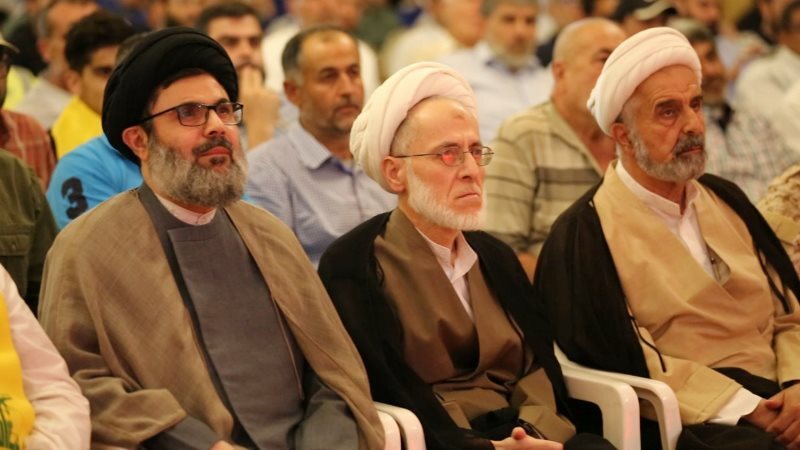 Sheikh Hashem Safi al-Din, head of Hezbollah's executive council (left), attends the July 21, 2018, ceremony in Nabatieh marking the anniversary of the Second Lebanon War (NNA agency, Lebanon, July 21, 2018). Sheikh Hashem Safi al-Din, head of Hezbollah's executive council (Radio al-Nur, Lebanon, July 23, 2018). On July 21, 2018, Hezbollah held a commemorative ceremony in Nabatieh to mark the anniversary of the Second Lebanon War and to honor the Nabatieh martyrs killed in the fighting. The ceremony was attended by senior Hezbollah figure Sheikh Hashem Safi al-Din, head of the organization’s executive council (for information about him, see Appendix B). Hashem Safi al-Din gave a speech stating that Hezbollah (“the resistance”) participates in the fighting in south Syria and to this day has not left south Syria or Syria. He also boasted that the United States and other countries could not determine the future of the region without a Hezbollah [“the resistance”] presence. He said, “From Yemen to Iraq, to Syria, to Lebanon, to Palestine…” He said the victory in south Syria increased the power of the Syrian army and the “resistance axis” [i.e., Iran, Syria and Hezbollah] (for quotations from the speech, see Appendix A). 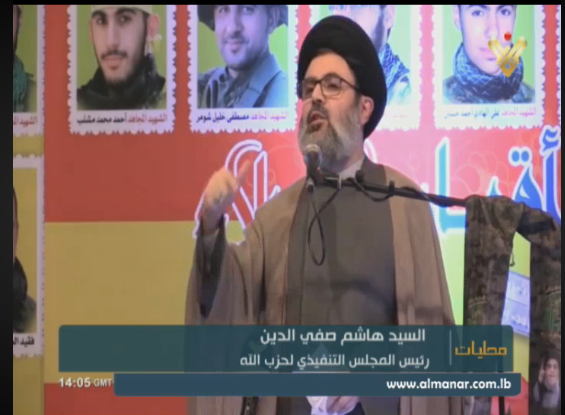 Sheikh Hashem Safi al-Din, head of Hezbollah’s executive council, delivers a speech at the ceremony held by Hezbollah in Nabatieh to mark the anniversary of the Second Lebanon War (al-Manar, Lebanon, July 21, 2018). 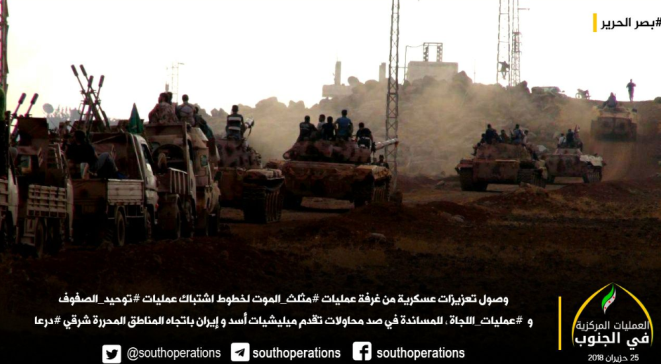 Hezbollah forces, apparently also from its elite unit, participate in the Syrian army’s campaign to take control of south Syria, including the Golan Heights (along with the Shi’ite militias handled by Iran). Until now Hezbollah had not publicly admitted its involvement in the fighting. That was done, in ITIC assessment, in order to prevent Israeli responses that might embarrass the Syrian regime and hinder the Syrian army’s campaign to take control of the Golan Heights. Now senior Hezbollah figures have publicly admitted that Hezbollah supports the Syrian army campaign and has a presence in south Syria. In addition to the statement made by Hashem Safi al-Din, a statement was made by Sheikh Ali Da’mush, deputy head of Hezbollah’s executive council. He praised the victories of the Syrian army and Hezbollah (“the resistance”) over the “takfiri gangs” (i.e., the jihadist organizations) and their regional supporters (from a sermon given by Sheikh Da’mush in the Bir al-Abed neighborhood in the suburb south of Beirut) (al-Manar TV, July 20, 2018). The statements were made by senior Hezbollah figures when the Syrian army campaign to take control of south Syria was nearing its end. In ITIC assessment, their statements reflect the feeling of achievement of Hezbollah and Iran, and show their desire to make political and propaganda capital of the upcoming victory. Their statements also reflect their defiance to Israel and the United States, and to a certain extent to Russia as well. They sendthe message that from now on, Hezbollah (with Iran behind it) is a significant force and has to be reckoned with, both in Syria and other Middle Eastern arenas. Hezbollah’s public position is particularly important in view of Israel’s demands, as reported in the media, to distance Iran and its proxies from Syria, and of Russia’s agreement to some of those demands. In ITIC assessment, the statements of Hezbollah’s senior figures may indicate that although Russia may have an interest in limiting an Iranian military presence in Syria (mainly in south Syria), it will be difficult for Russia to translate its desire into practice, in view of the resistance expected from Iran and its proxies (mainly Hezbollah). 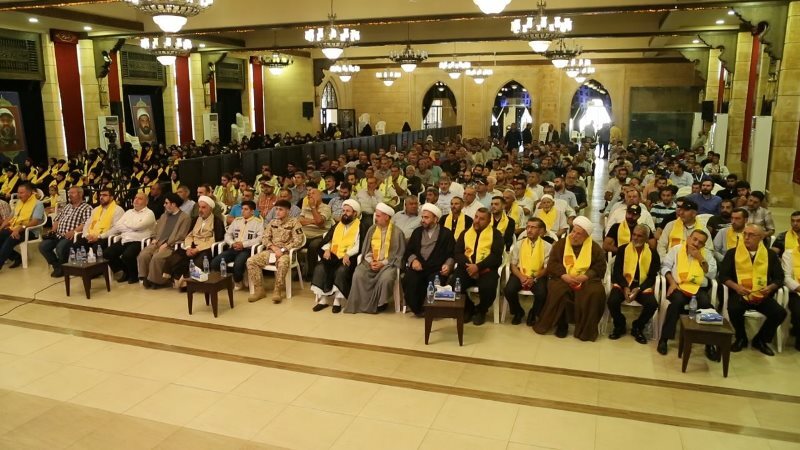 On July 21, 2018, Hashem Safi al-Din, head of Hezbollah’s operational council, participated in a ceremony held in Nabatieh to mark the anniversary of the Second Lebanon War and to commemorate the Hezbollah martyrs from Nabatieh. The event was attended by the mayor of Nabatieh; a Hezbollah field commander; public figures and family members of the Hezbollah martyrs. The ceremony held by Hezbollah in Nabatieh to mark the anniversary of the Second Lebanon War. 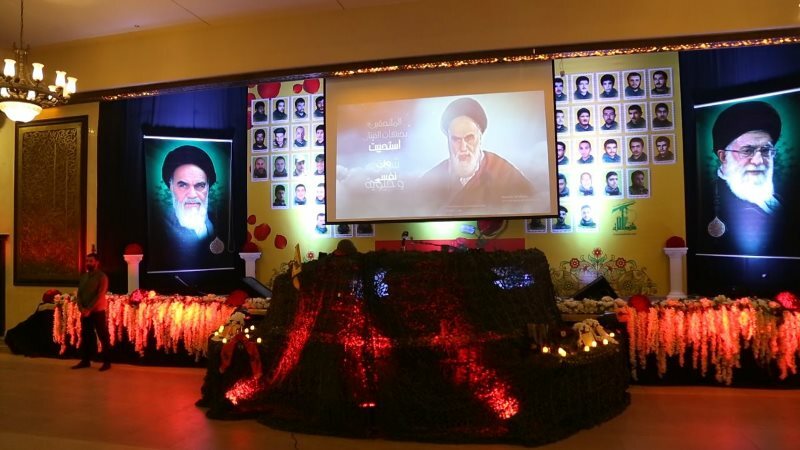 Left: Pictures on stage: the Ayatollah Khomeini (left) and Iranian Supreme Leader Ali Khamenei (right) (NNA agency, Lebanon, July 21, 2018). He then spoke about the regional aspirations of Hezbollah [which is Iran’s main proxy for advancing its own regional aspirations.] He said, “Anyone who imagines there will be a new Sykes-Picot [agreement] is mistaken. Anyone who imagines that the United States or the Arab states or any other country in the world can determine the future of the region, from Yemen to Iraq, to Syria, to Lebanon, to Palestine, to the entire region – without the presence of the resistance [Hezbollah], is mistaken …That is a truth we have to accept and that is a truth we are proud of and it will never be forsaken…The resistance [Hezbollah] is strong, strong in Lebanon and strong in the region. It is present and will be present on the map of the future. That is because the map of the future, after so many years, has to be [drawn] for the good of the people of the region, from Palestine to Yemen.”Another source quoted Sheikh Hashem Safi al-Din as saying that the victories of the Syrian army and the “resistance” [Hezbollah] caused the failure of “the Israeli and American terrorist plan for the region.” He said Syria had overcome the “criminals” [i.e., the rebel organizations], and they had been defeated from the north of Syria to its south. He said today the failure of the Israeli and American plot could be seen [by all], as well as the retreat of the terrorists, the “agents of the United States and Israel,” from south Syria [i.e., the rebel organizations]. 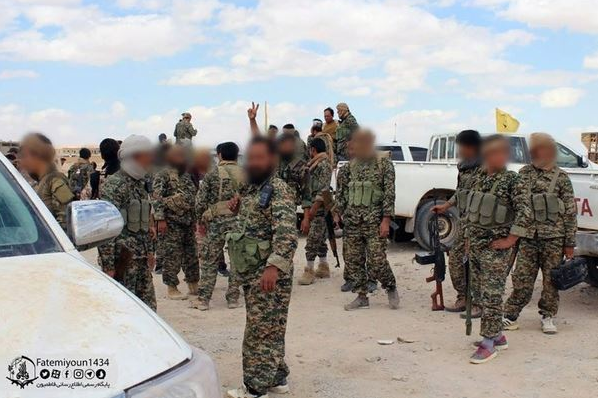 The result, he said, was the increase in the power of the Syrian army and the “resistance” axis (al-ansar.net, July 22, 2018). Sheikh Hashem Safi al-Din was born in 1964 in the village of Deir Qanoun al-Nahr in the Tyre district in south Lebanon. His family is part of a respected Shi’ite clan that has produced religious figures and members of the Lebanese parliament. On his mother’s side he is a cousin of Hezbollah leader Hassan Nasrallah. His brother Abdallah Safi al-Din is Hezbollah representative to Iran. Hashem Safi al-Din studied theology in Najaf, Iraq, and in Qom, Iran, along with Hassan Nasrallah (revolvy.com). When Hezbollah was established by the Iranian Revolutionary Guards Corps he joined the organization. It was reported that he underwent training in Iran during the 1980s (counterextremis.com). Over the years he filled a series of positions in Hezbollah. 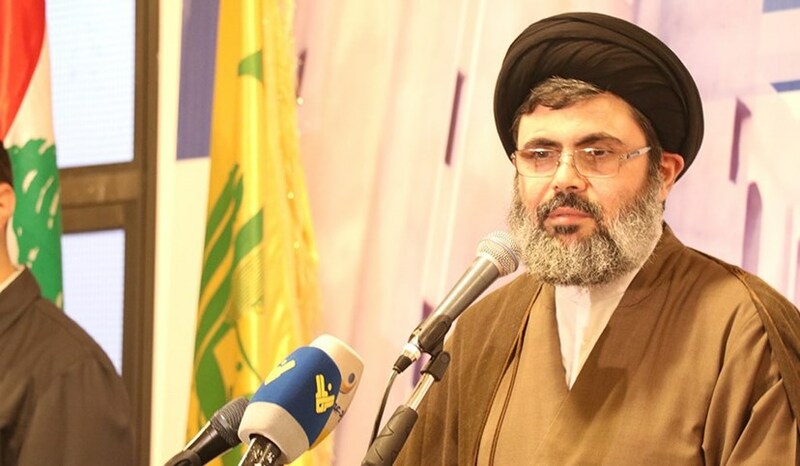 Today he heads the executive council and is also a member of Hezbollah’s Shura council. He is considered as the second most important person in Hezbollah, or the third (after Na’im Qassem). On May 19, 2018, the American State Department designated Hashem Safi al-Din as a terrorist. According to the American announcement, Saudi Arabia joined the United States, freezing all of his assets in Saudi Arabia. Al-Arabiya TV reported that the Saudi Arabians designated him as terrorist and “number two” in Hezbollah (al-Arabiya, May 10, 2017).